« To Svalbard and Beyond: Where has all the Methane Gone? This week in Kiruna, Sweden was my first field trip and first time north of the Arctic Circle. This time of the year there is 24 hour daylight, a stark contrast to the vision I had of Santa Claus’ home – who knew that in Lapland you have to pack sunscreen! It all makes sense if you think about the reason for the field trip, the wetlands, and how as the temperature gets warmer methane is released. On Monday afternoon I had my first flight, and not only was the science experience great but the view was spectacular! 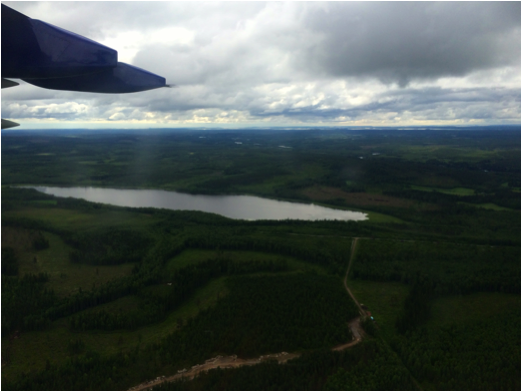 We flew two different low East-West legs from Kiruna over the Finnish wetlands (most likely the more brownish areas, see photo). What I did not expect was such a bumpy ride: even with very low winds, 500 ft above ground means lots of little air holes and little bumps! Luckily, one of the science aims was to profile up to higher altitudes, to assess the local atmosphere’s vertical structure. Seeing the measurements in real time while flying is definitely a wonderful experience! It took a while to get my first plots working, but afterwards, every little variation I spotted in methane was a highlight. The flight for me was therefore not as “dull” as the Mission Scientist 1 (an old hand at this) called it. An interesting aspect of the flights was the discussions over the headphones deciding whether to continue the planned flight or to change altitude to get a better idea of concentrations or fluxes. The flying on Monday was followed by yet another first-time experience: flight planning for Thursday – no mean feat! 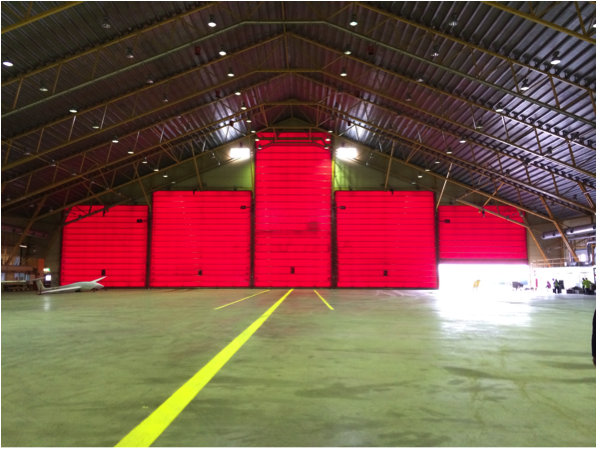 The office space in a hangar did help to imagine a plane journey! It is only when I helped produce a plan that I realised how much work goes into a successful research flight and a successful measurement campaign. I learned that weather is probably the most important but also variable factor. 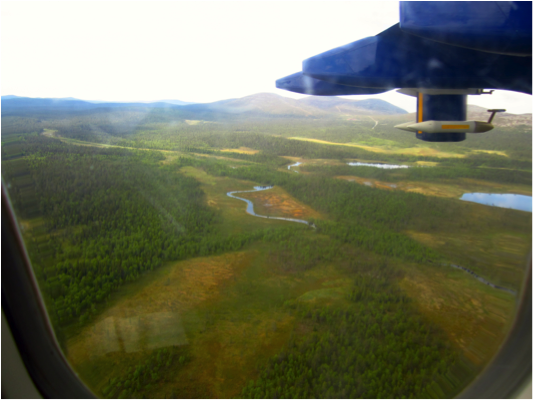 Considering the rain, wind and cloud forecast for Thursday, we prepared two different sortie plans, considering timings, distances and the altitudes for the measurements to ensure the fuel would bring us back to Kiruna. Unfortunately Thursday arrived with a near constant cloud cover making flying at low altitudes impossible due to bad visibility. We tried our luck and found a gap south of Kiruna and managed to fly a quarter of our flight track at the desired altitude of 1000 ft under the clouds. Lucky me, who took an anti-sickness pill before take-off! The rain arrived soon after the first leg and we ended up profiling up and down the atmosphere searching for different methane layers transported from other regions and sources. Analysis will show whether we got lucky! In conclusion, this week was full of interesting and fascinating new experiences, and showed me how exciting science can be and how much we depend on our environment! 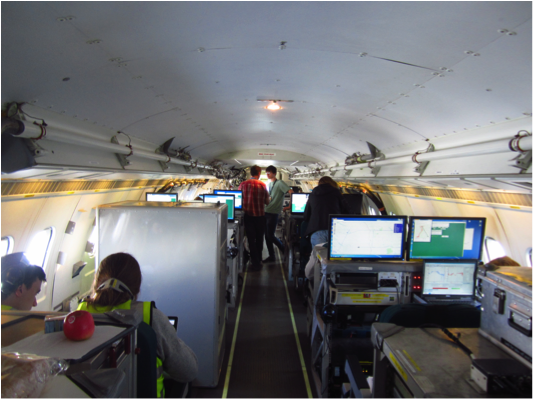 A team of Atmospheric Scientists have been using the British research plane BA-146 to take airborne measurements of Methane in the Arctic. Have a read below..
What came of our labours in the Arctic field? To Svalbard and Beyond: Where has all the Methane Gone?